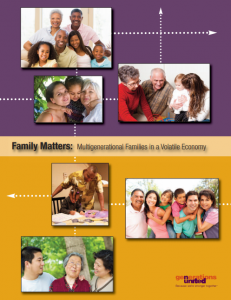 Family Matters is a report from Generations United that includes findings from a national survey on multigenerational families, stories and policy recommendations. Today more than 51.4 million Americans of all ages – or about one in six – live in multigenerational households, a more than 10% increase since the start of the Great Recession in 2007. Some multigenerational families choose to live together; others form because of the widespread impact of the nation’s economic downturn and uncertain recovery. Whatever the reasons, multigenerational households are an increasingly important part of the socioeconomic fabric of the United States. This represents a reversal of the long-term trend towards living in nuclear families – one that creates both challenges and opportunities for policymakers and the private sector.